This very magickal, very beautiful tube "Moonlit Bay" from Graphfreaks will have you weaving a spell of your own. This PU/PTU tube comes in 3 different sizes,Half, Full & Close-up for any style tag you make. 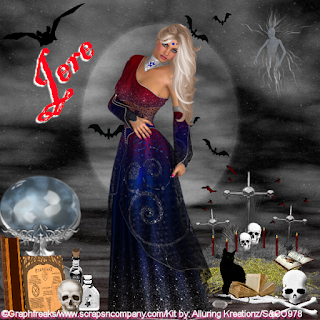 She is very versatile, and pairs well with any witchy, goth, mythical, or even dark kits. I paired her with a kit by Alluring Kreationz, and had so much fun with her.